Aristotle views philosophy as the essence of whatever is actual, while Plato considers it to be the science of the forms or ideas. However, both regard philosophy as connected to the universal, Plato claiming that the universal exists independently from particular things and acts as their prototype, and Aristotle considering the existence of the universal in particular things, acting as their essence. Aristotle's philosophy implies the ascension from studying particular phenomena to knowing their essence, hence the general truth, while Plato implies the descent from the universal idea in order to study its particular imitation. The Aristotelian philosophy has been the base for development of the Western thought and culture, but influences can also be traced in the Middle East, the Arab world, even Africa. Aristotle was born in 384 BC, in the ancient city of Stageira in Macedonia, Northern Greece, which is about 35 miles from modern-day Salonica. He belonged to an aristocratic family and his father Nicomachus, was the personal physician of the Macedonian king Amyntas. When he was 18, he joined Plato's Academy and stayed there for twenty years. After Plato's death in 347 BC, he left the Academy and travelled to Asia Minor. There he visited the court of Hermias of Atameus and married his niece and adoptive daughter, Pythias, who bore him a daughter, named Pythias, after her mother. Later he travelled to Lesbos where he studied the fauna and flora of the island. When he returned to Macedonia, he got involved in the education of Alexander the Great, whom he encouraged to proceed in the conquest of the East. However, in 335 BC, he went back to Athens to establish his own school, the Lyceum. Aristotle was in the habit of walking about while teaching his students who followed him, and that is why they were given the name "peripatetics". While being in Athens, his wife died and from his affair with Herphyllis of Stagira he got a son, Nicomachus, named after his father. He stayed in Athens, as head of the Lyceum, for twelve years, from 335 to 323 BC and it is during that period when he wrote his treatises, Physics, Metaphysics, Politics, De Anima, Poetics and Nichomachean Ethics, which were meant to be studying aids to his students. Aristotle died in Chalkis, in Eboea in 322 BC. Aristotle's writings can be classified in two main groups. The works that Aristotle himself published, but which are either lost or only some fragments remain, and those that he did not publish himself, but were collected and preserved by others. In the first category, there are his most popular works, the "exoteric" ones, which were written in dialogue form, resembling the Platonic dialogues, and were meant for reading by the general public. In the second category fall the works that he termed as "hypomnematic" and they are notes that help the memory, as well as some material that could be used as foundation for expansion or further work. Because most of the manuscripts were lost during the first centuries of the Christian Era, the group of his surviving works are mostly treatises meant for academic purposes and are written in a concise way. Those are 47 works contained in two volumes in the Greek text, as they were published in the standard Berlin edition in 1831. First of all, Aristotle dealt with logic, which he considered as the preliminary tool for the study of every branch of knowledge. He expanded on economics, systems of government, physics, geology and geography. He also dealt with the constitutive elements of the natural body, he studied the celestial bodies in space and the natural sciences, and helped with the biological classifications of living things. He delved into theology, metaphysics, aesthetics, ethics, rhetoric, poetry, literature and education. If the whole of his work was available, we would have a complete encyclopedia of the Greek knowledge at his time. Having studied for twenty years in Plato's Academy, Aristotle was greatly influenced by the Socratic doctrine of immortality of the soul, as it was taught at the Academy, and his first works revolved around thoughts of the next world and the worthlessness of this life. Also, having in mind the Platonic transcendentalist theories on the nature of the soul, Aristotle wrote on the immaterial essence of the soul and made distinctions on human intellectual powers, like thought, perception and imagination. However, Aristotle does not neglect happiness in personal and family life, the prosperity of the children and future generations as they are depicted in "De Philosophica", where the role of the philosopher is also successfully defined. 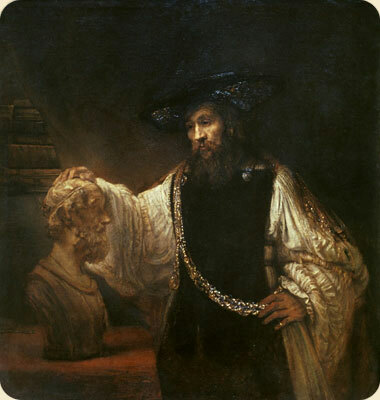 Aristotle culminates his philosophy in five main stages: a) the covering of man's necessities to survive, b) the arts that beautify life, c) politics that secure a good life, d) the knowledge of making proper use of the means of life, and e) the leisure to philosophize and move above the the material world to explore man's divine nature. Aristotle was a student of Plato, and a teacher to Alexander the Great. Goethe compared the Aristotelian philosophy to a pyramid rising high from a broad base on the Earth. 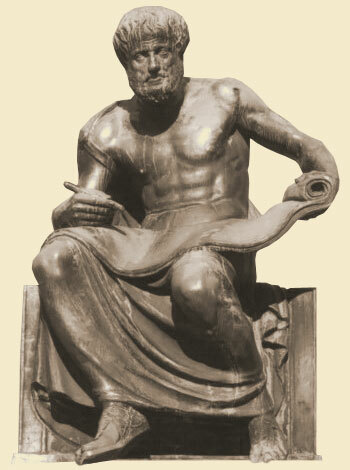 That is the reason why Aristotle's philosophy must be prudently approached, first from the analysis point of view, and when this is grasped and appreciated the reader can continue with his logical works in the Organon and his studies on space and time in the Physica, before proceeding to the Metaphysica and in De Anima for deeper insights and exploration of the divine.